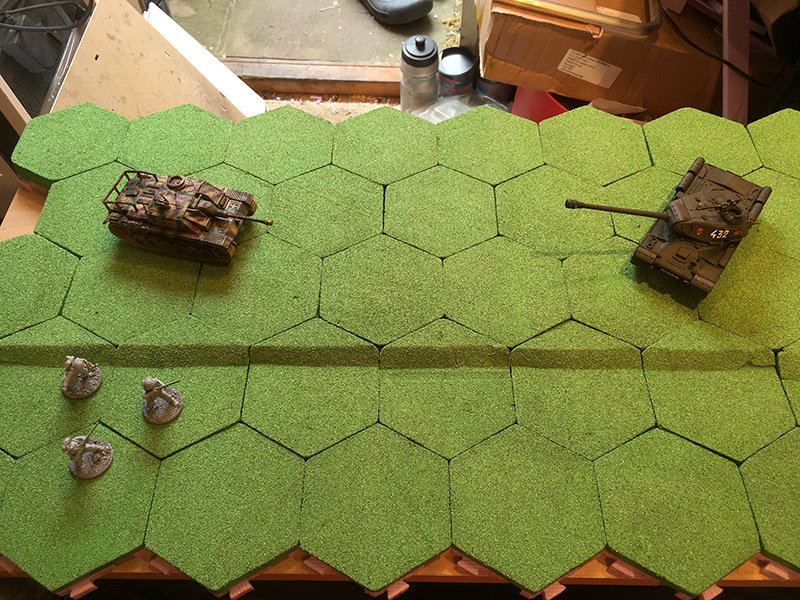 Since I got my Hex Terrain Toolkit, I have been spending most of my free time making terrain hexes for my first wargaming table. 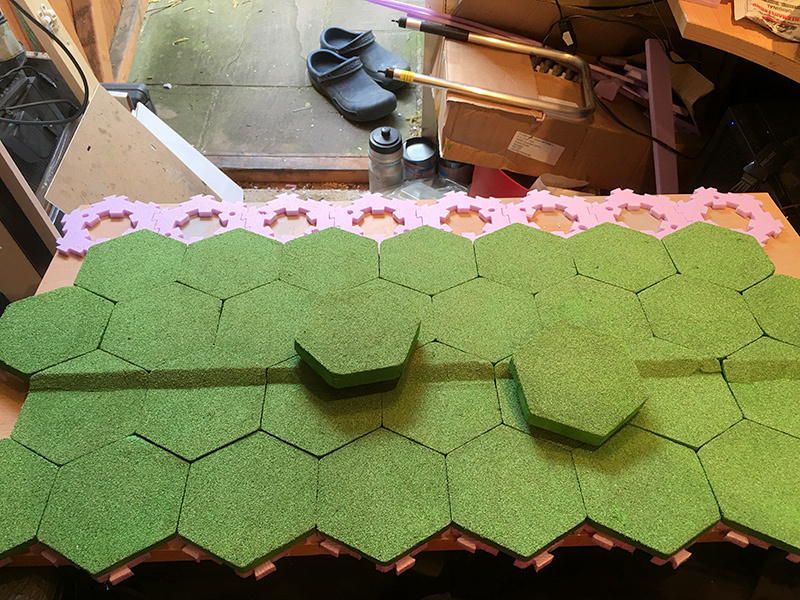 I wanted to create enough hexes to have a 6 foot by 4 foot table. I had no idea how many hexes that might take, which probably was a bit of a mistake. Now I’m nearly complete I’ve found that the number required is 336; that’s an awful lot of hexes. I’m using 6mm and 10mm foam core in the form of 600mm by 1200mm underfloor heating insulation sheets. 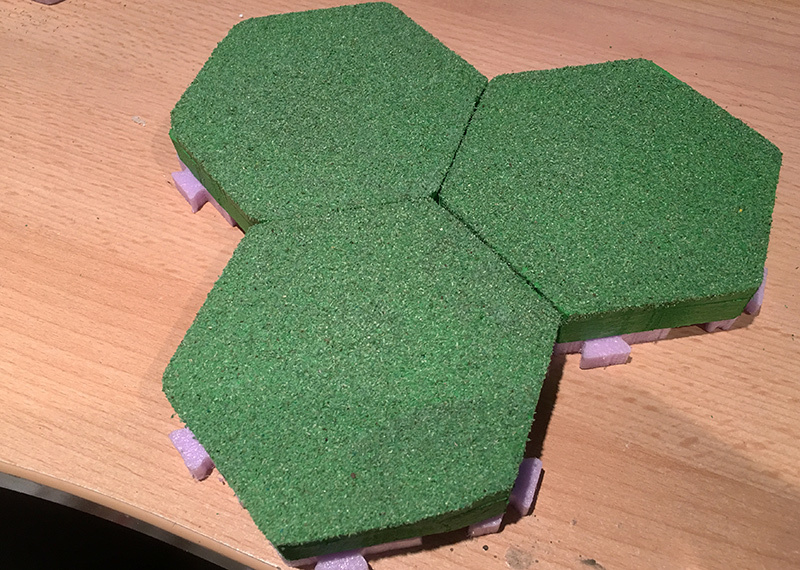 The Hex Terrain Kit is based around making hexes that are either 7.5mm or 15mm. 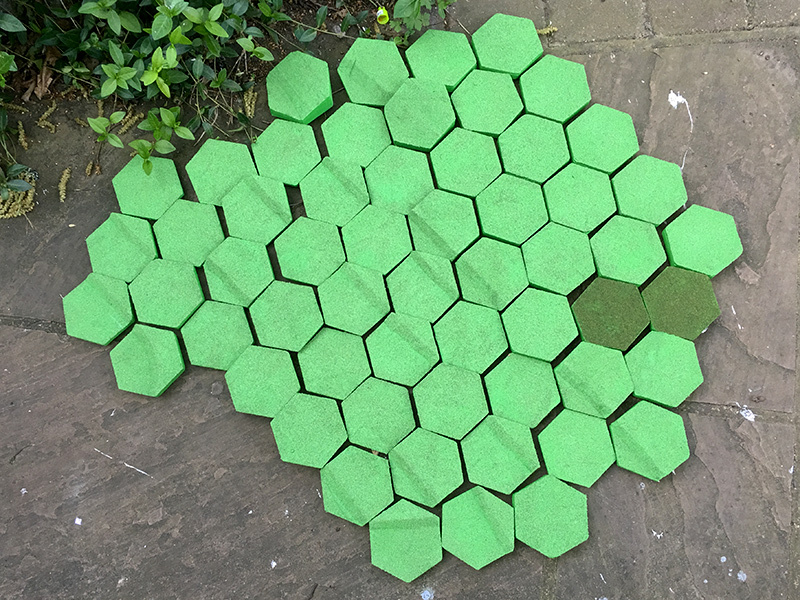 This means that to make a full size hex I need to glue two sheets of foam board together and then I need to shave them down so they are either 7.5mm or 15mm. 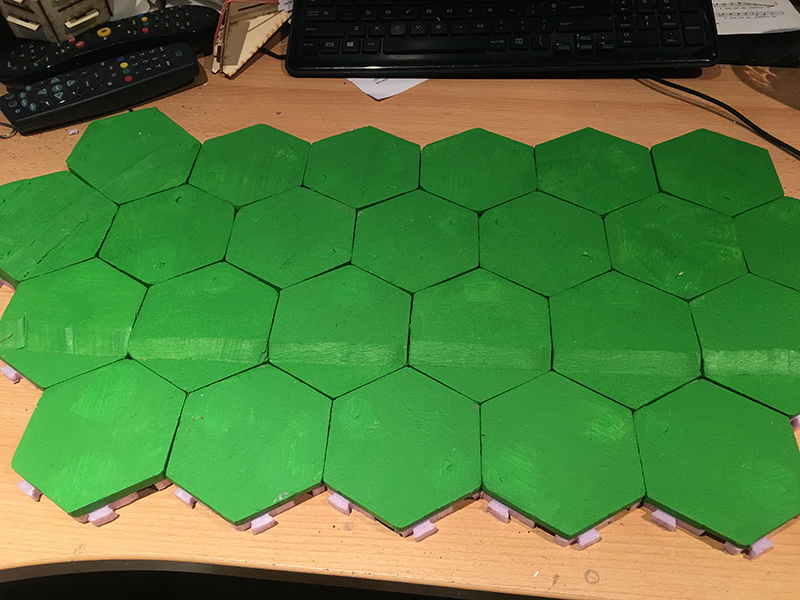 Most of the plain hexes are a mm and a 10mm section glued together and then I have to shave 1mm off to make them 15mm thick. This is actually easier than it sounds as a template is provided which allows you to easily carve off the top 1mm of foam board. It does take time though, three weeks so far. Each plain hex actually consists of three parts. There is the interlocking snowflake which forms the base of the terrain, the hex itself and a small cog which is glued to the center of the hex bottom enabling it to slot into the snowflake so that each piece forms part of a whole which can’t be knocked out of place. 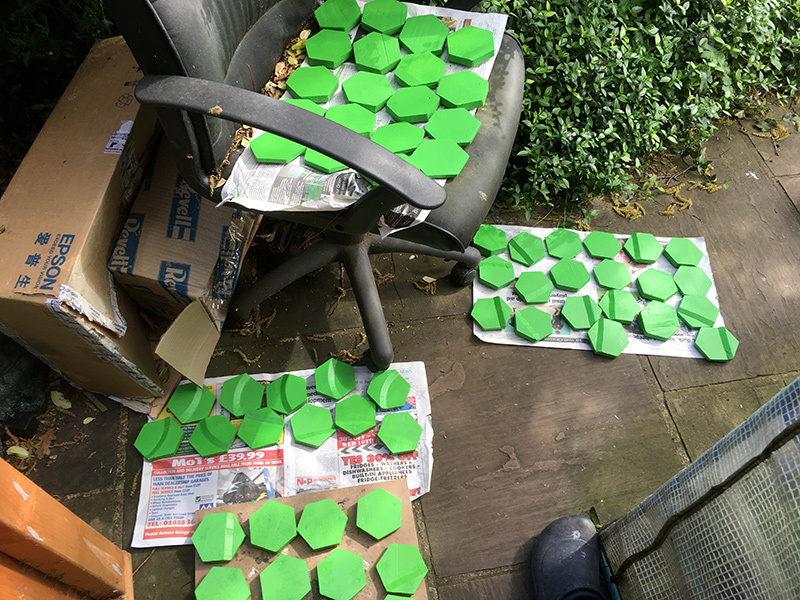 Once the hexes are made, they need to be painted. 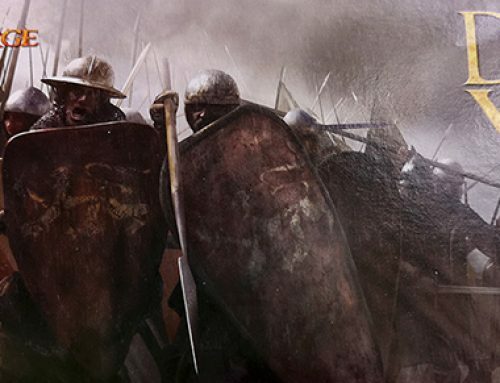 I got a 2.5 litre can of green paint from my local branch of Wilkinson’s for about £10. It was a little bit brighter than it appeared on the label but as they are being flocked, only the edges will show. I found that two coats are needed for full coverage. I came cross a problem with flocking; I had a tub of mid green flock which I think looks really nice on the hexes. Unfortunately, after about 150 hexes I started to run out. 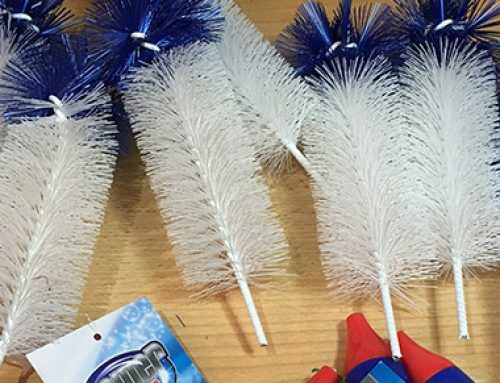 So it was off the Ebay to try and find some extra flock. The trouble was, I can’t remember where I bought it or what manufacturer made it. 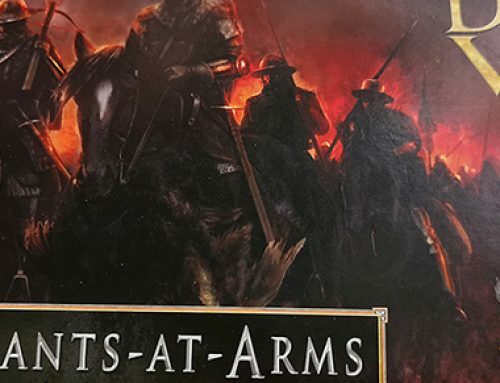 I’ve discovered that trying to identify unknown flock via Ebay photos is not good; I bought some Expo Dark Green Scatter, which appeared to look similar in hue to mine, but it wasn’t, too dark. So I bought some mid green from the same seller. That was too pale, and it came in plain grip bags so I have no idea who made it. Rather than waste more money trying different colours to try and get a match, I have mixed up the four packs I bought to create my own hue, it’s not quite as good as the first half of my hexes, but it will have to do. I’ve reflocked the initial hexes so they all look roughly the same. 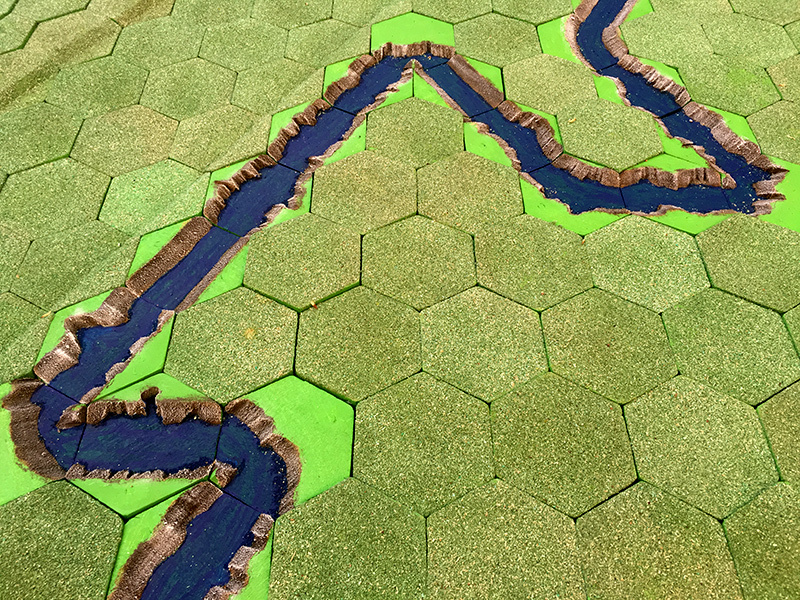 My latest addition to the collection was some river hexes. 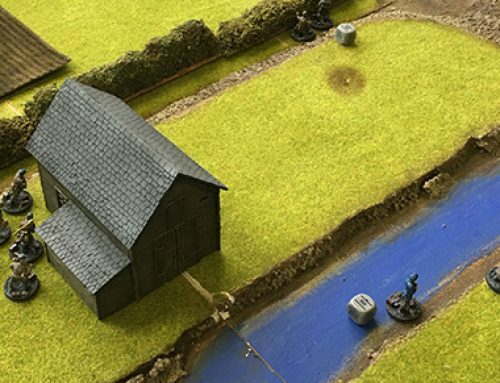 I’ve now made enough to have a meandering river the whole way across the board. I added some coarse sand the the river banks and painted them brown with a white highlight, then added two coats of blue which I got as a tester pot for a quid from Wilkinson’s. 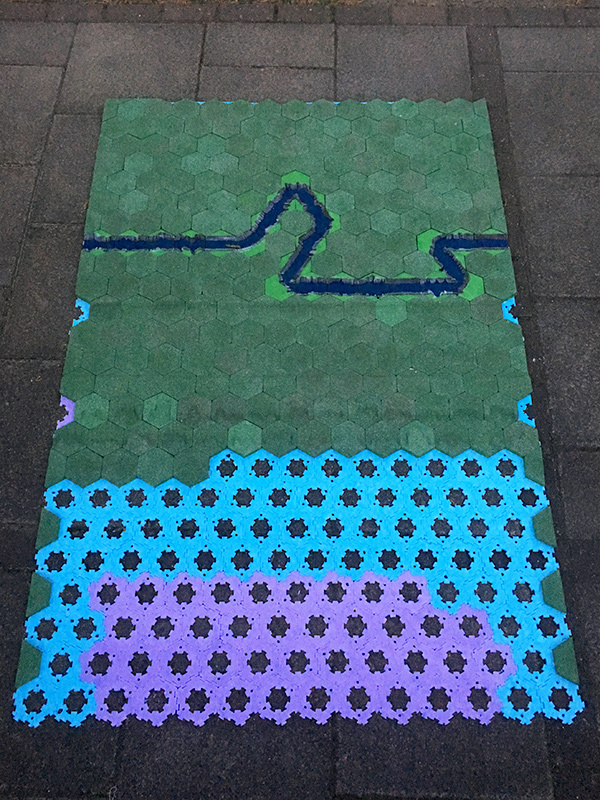 The below pic shows where I am to date, though since I took this photo yesterday, I have now made another 40 standard hexes which have been painted and are currently drying so I can give them their flock coat tomorrow.